I can’t tell you how many times I’ve fielded this request, or a similar one. The local chapter of the National Junior Honors Society (NJHS) requires that its members spend hours volunteering to better their communities. For legal reasons, regular volunteers for our Children’s Department must be 14 or older. Parents tell me they’ve reached out to many local organizations searching for volunteering opportunities, but few if any will accommodate tween volunteers. Our Teen Advisory Board meets once a month to plan tween and teen programs, write book reviews for publication on our social media accounts, and work on other tween and teen services-related tasks. The Board is open to all tweens and teens in grades 6-12. This is a great way for NJHS tweens to create programs they can enjoy while earning those elusive volunteer hours. But two hours per month isn’t enough to fill their volunteering requirement. To fill the need for more volunteer hours, we offer periodic volunteering programs for tweens and teens. In 2016, we switched to a new phone system and were left with many phones that were too old to be sold or donated. 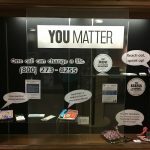 We asked tween and teen volunteers to paint the phones and displayed them in the Library as well as local schools, the local city hall, and the community center. The purpose? Suicide prevention awareness. One of our teen librarians, Jennie Willard, even wrote an article about it which was published in School Library Journal. 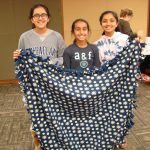 Every winter we host Warm Wraps, a program where tweens and teens work with our local quilting club to learn sewing skills and use them to create shawls and blankets for people in local retirement communities. Each January around National Law Enforcement Appreciation Day we host our version of Operation Goody Bag, which was founded to honor first responders after 9/11. 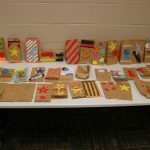 Our tweens and teens fill decorated goody bags with treats, which we give to local police officers, firefighters, and paramedics as a thank you for working during the holidays. This gives the tweens and teens a chance to get to know the local public safety and emergency teams. This post addresses the following ALSC Core Competencies: I. Commitment to Client Group, III. Programming Skills, and VI. Administrative and Management Skills. I love these ideas! How marvelous! Sometimes when I have a tween or teen who needs just a couple hours of service learning and I don’t have anything particular for them to do, I assign them to research in the databases on our website and fill out a simple form I created about what they looked for. The “service” part of this activity is that they are then supposed to tell at least one teacher and one friend about one of the databases they discovered. Laura, that’s a great idea to get them acquainted with your resources and pay it forward! Thanks for sharing!